Hello everyone, welcome to 2013. I know I’ve not been about for the past few weeks, I decided to take the Christmas holidays off and have a break, spend some time with my boys and prepare for the new arrival and I did just that. 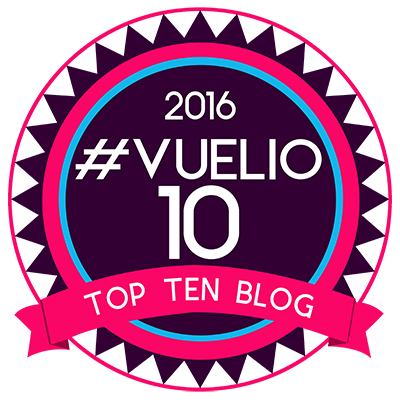 But now I’m back, have I missed blogging? Yes and no. 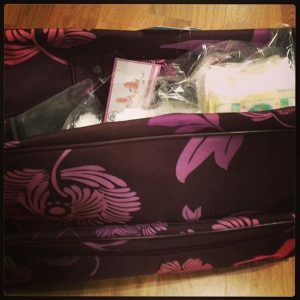 I think if it had been any ordinary two weeks off then I would have missed it like crazy but since we were so busy and had lots of family time, I really didn’t have the time to blog. Yet I still missed having my own little space to chat and converse with you all. Firstly Happy New Year to you all. I hope you had a lovely Hogmanay and I with you health and happiness in 2013. It’s going to be an eventful year for the Mann household with a new baby being born in a few weeks and Tyler will start school in August. I can’t believe that has come round so quickly, he’s still only 3. Well for another two weeks. The title of this post isn’t the best, but I couldn’t come up with something quirky. I think these Christmas holidays have been my best ones ever. I love Christmas, but the boys were fab this year. Christmas eve is Lucas’ birthday so we kicked off the celebrations early with him opening presents in the morning and then we went bowling in the afternoon with both boys. No I didn’t bowl being almost 9 months pregnant but I was there cheering them on. Then we had a family dinner in the evening with the grandparents, auntie, uncle and cousins. We had a lot of fun. Lucas wanted a Treasure Chest cake which I made myself, it’s the first time I have made either of the boys a birthday cake. So bare with me, it’s not the best. We had lots of balloons and played with lots of toys. 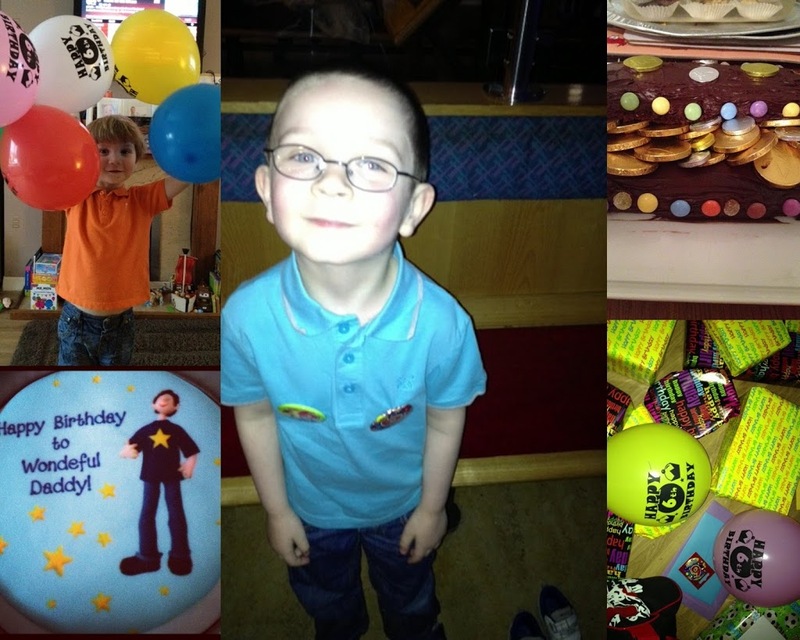 Here is a selection of pictures from Lucas’ sixth birthday. The other cake in the picture is from daddy’s birthday which is the third of January, I will come to that in a second. Around eight o’clock it was time to leave birthday mode and get into the Christmas spirit. Ollie the elf delivered the boys new pjs, their stockings and a letter to say goodbye, which was very sad, we miss Ollie. We put out some reindeer food for Rudolph and the others and gave Santa a slice of cake and some sprite. Off to bed the boys went. This was the first year Lucas was very aware of Santa and every time I tried to sneak into to get the stockings he’d wake up thinking Santa was in his room, bless. Next year they are being hung in the living room. Lesson learnt. The boys weren’t up as bright and early as I thought and Robert and I were trying to make noise to waken them. 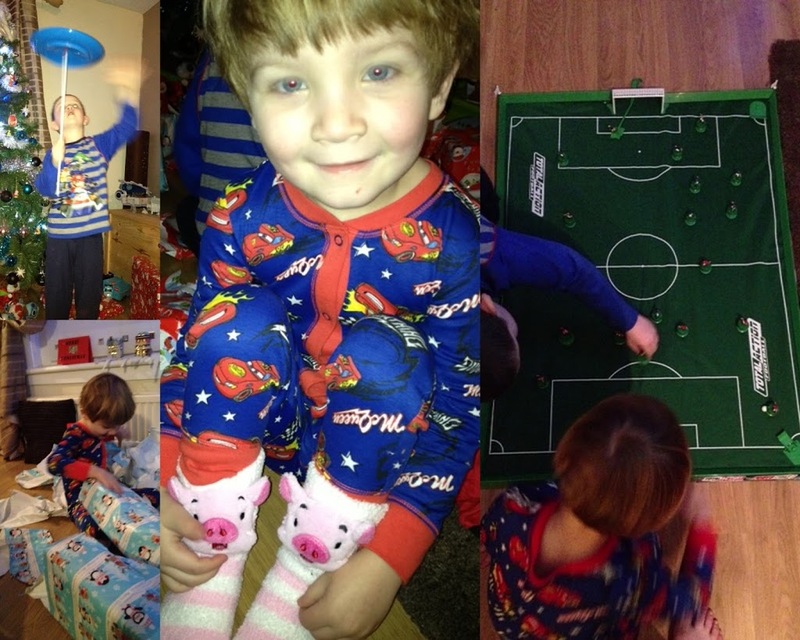 Here’s a selection of pictures from Christmas morning. Lucas favourite toys from Santa, spinning plates. Yes they were on his list thanks to the circus project at school and Tyler, he’s very easily pleased he got fluffy piggy socks. Lots of paper being ripped and toys being played with. It was a wonderful sight to see. Then it was over to the inlaws for more of the same present unwrapping and playing. We had Christmas dinner there that evening and my mum came too. A wonderful day, topped off with Lucas puking when we got out the car on the way home. Over excited and tired. The next few days were a blur of building toys, playing with toys and finding new homes to put the said toys. The boys were so happy and having mummy and daddy both off work made all the difference to them. It was such a joy and they were a joy. Hogmanay so yet another birthday, this time it was my brother in laws. So we were down there for a family birthday dinner and we brought in the bells there, with hubby doing the first footing. Everyone including the boys were up until just after midnight. It was lovely to wish the whole family Happy New Year together. Some recovery and more toy playing over the next few days and then it came the third of January. Being in Scotland we get an extra bank holiday at New Year, yes I know we are lucky or really it’s just so our hangovers have worn off I think, who knows. Hubby and I should have been back at work but we took it as a holiday as it was Robert’s birthday. Happy Birthday to my wonderful husband. We had balloons and cake, the one you see above, which was a gluten free cake, not made by me but made by the lovely Baker days, who sent it through just for him. I have yet to perfect my gluten free cake making. The rest of us had a store bought full of gluten cake. Another family dinner in the evening, yes you can see a pattern forming with Robert’s family and the way they celebrate birthdays. Took a while for me to get used to their closeness, but it’s lovely and I love being included in their family. I took the Friday off too as I had my last growth scan. More on this in my bump post, which I will post later on this week. It was a sad day and one for reflection on Friday as this was the day of the lovely and special Multiple Mummy. I had the honour of meeting Kerry at a few blogging conferences and talking to her via twitter. She was such a warm and loving person, one of those people who light up a room. She sadly passed away leaving behind a beautiful family. I don’t think there is one person in the Parent Blogging community who hasn’t felt something at the passing of Kerry. I for one was heartbroken that something so tragic could happen. But also it made my grateful for what I have and don’t take anything for granted. I hugged my boys and my husband that little big longer and that little big tighter ever since. RIP Kerry. On a lighter note on the very same day one of my blogging friends Helen from The Crazy Kitchen sent me through a surprise, one I couldn’t have ever imagined. She had listened to me being stressed out on twitter about not being organised for the birth and not having a single thing for my hospital bag. Well she went and sent me through a pre-packed hospital bag. How sweet is that? No-one has ever done anything so lovely for me. I sat there in tears yet again, but this time not tears of sadness, tears of joy, gratitude and relief. I cannot thank Helen enough for this and this gesture will always stay with me. So that’s it for the end of 2012 and the beginning of 2013. What will it bring? My hope is a healthy, happy baby, that I can cope with three children, my boys love their new sibling and we will all enjoy my maternity leave and be one big happy family. I wish you all a good 2013 and hope all your hope and dreams come true. What do you wish for 2013? The Gallery 126 - It's Beginning to look a lot like Christmas.